For that last five years, we've been collaborating with Puma Canada to take their brand to the forefront of the digital space. Social media has become part of Puma's DNA, allowing us to create breakthrough digital consumer experiences and form valuable partnerships. Puma's progressive thinking and willingness to take risks has made them the perfect digital partner. We built a unique gaming channel to engage Puma fans and increase the brand's owned media across its social platforms. 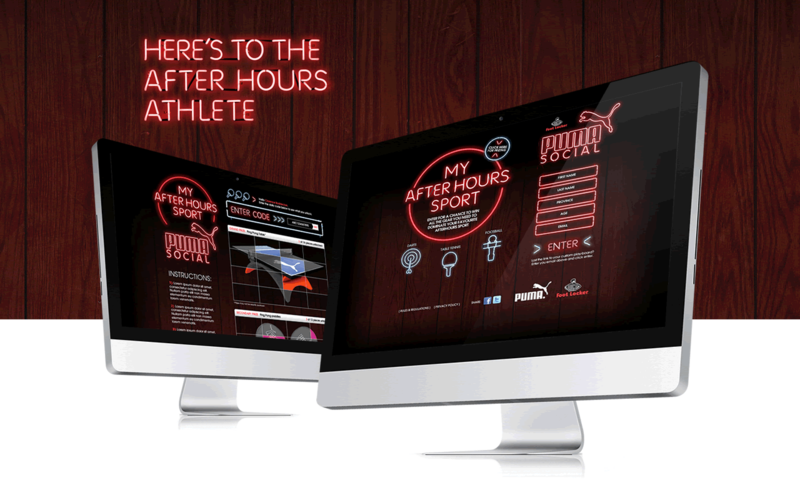 A series of 5 promotions that utilized various technologies including geolocation, QR codes and 3D capture which, when all was said and done, resulted in more than 400,000 contest entrants and 500,000 social likes and follows for Puma Canada's promotional partners. One of the most popular promotions accounting for approximately 200,000 likes from the facebook community. Bingo cards were posted socially twice a day on facebook and twitter using a unique code. Users simply pasted the code to unlock the piece on the gameboard. 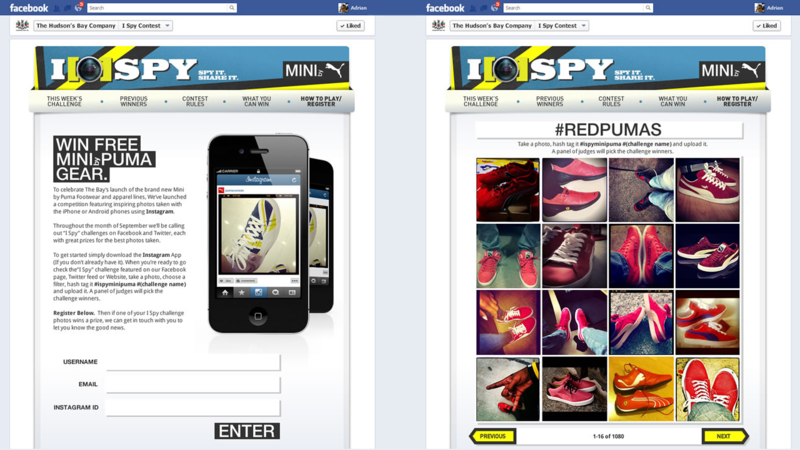 We created the Puma Canada App to help the brand make a deeper connection with its already dedicated audience. 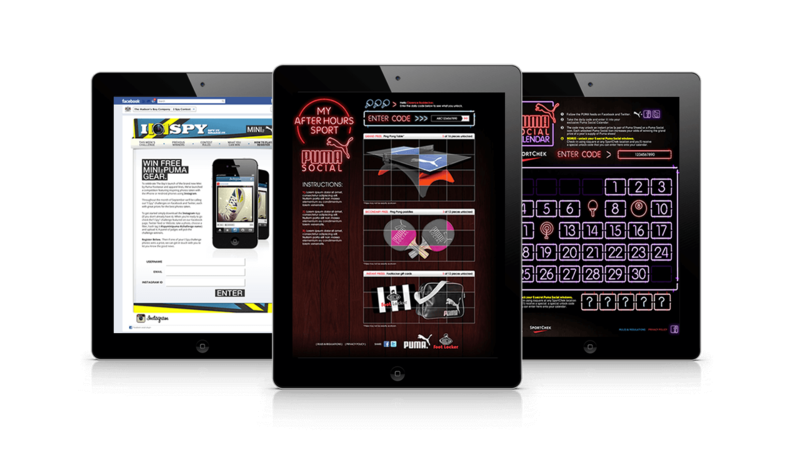 Showcasing digital lookbooks seasonally combined with delivering the latest news and announcements has helped drive sales while increasing brand awareness. With more than 10,000 units installed, the app has also become a hyperactive platform for event and social interaction. Over the course of one calendar month, Soci executed an extended Puma promotion through Facebook and Twitter garnering new engagement every day. 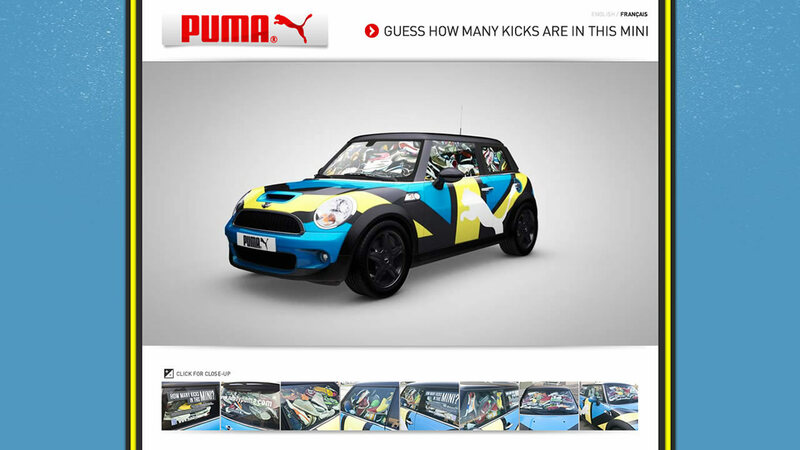 Each day unique codes were posted on Puma's social platforms. The codes unlocked days on an advent-style calendar offering chances for players to win daily prizes. Repeat engagement was encouraged by allowing 1 entry per door and the more doors a participant unlocked, the better their odds were at winning the grand prize. The promotion exceeded 40,000 entrants and drove over 600,000 unique page views and interactions. Partnering with BMW Mini, we activated a scavenger hunt on Instagram and Facebook where participants were asked to post photos of specific items with the #ispypumamini hashtag. The contest resulted in more than 5,000 entries and image tags driving over 100,000 media impressions. This was a real-time activation that extended into online and mobile. We filled a Mini Cooper with Puma shoes and parked it at the Yonge & King Hudson's Bay Location. For fans that weren't in Toronto, we captured the vehicle in 3D so that they could enter their guess from anywhere in the country. The contest resulted in over 50,000 entrants nationwide. Soci designed, built and executed a social media Puma promotion through Twitter and Facebook. Users registered and received a unique playing card to track their progress. 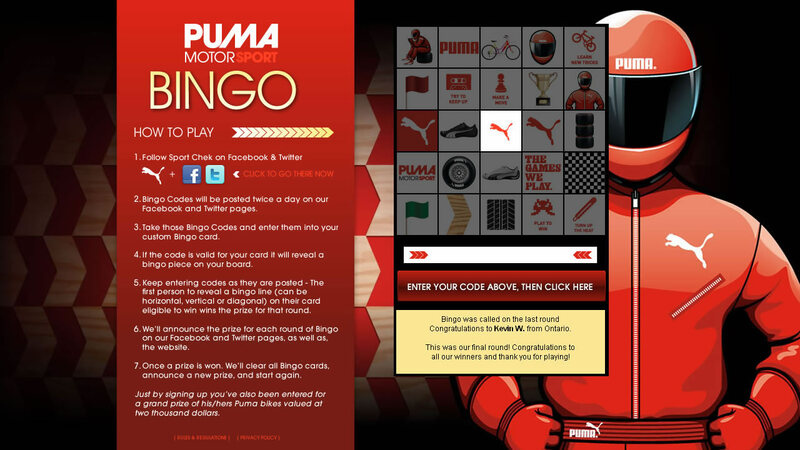 Each day, unlock codes were posted out to Puma's audiences on both platforms that revealed parts of different images representing potential grand prizes. Players chose which prize to compete for and the first user to unlock a complete image won the corresponding prize. Participation exceeded 50,000 entrants and drove over 500,000 unique page views and interactions.